Jim Von Holtum is the third-youngest child, and the youngest boy, in a mixed family of eight brothers and sisters. His half-brother Greg Vaske was already 13 years old when his baby brother was born. Greg was off to college by the time Jim was old enough to start kindergarten in Worthington, Minnesota, where they grew up. Still, the two boys shared a special connection. They had the same sense of humor and the same laid-back attitude. They both had an interest in sports. Greg played a lot of fast-pitch softball, and Jim loved to tag along. He served as bat boy and traveled with the team when they had tournaments out of town. The brothers also spent time fishing together. When Jim was in high school, he was the main babysitter for Greg's children. "In a big family where everyone gets along so well, you don't have a favorite. But you do tend to have more in common with some than others," Jim says. "That was just always the case with Greg and me." Five years ago, the brothers' bond got even stronger when Jim found himself in need of a kidney transplant. Greg was a match, and a successful living-donor kidney transplant at Mayo Clinic gave the siblings an experience they now both treasure. Jim was 33 when he first experienced trouble with his kidney. A bout of illness and severe dehydration sent him to the hospital, where an MRI showed cysts in his kidney. Doctors recommended Jim follow up with a urologist. But as is the case with many men in their 20s and 30s, Jim believed he was invincible. Instead of seeing a urologist, Jim worked on getting himself rehydrated, started to feel better and went back to life as usual. "Young and dumb is a really good way to describe my attitude at the time," Jim says. "I thought, 'It can't be as serious as what they're saying. I'll be fine.'" He wasn't fine, but it would be a few years before he realized just how sick he was. It wasn't until 2008 that a routine screening as part of a life insurance application identified what Jim describes as "astronomically high" blood pressure. That scared him enough to prompt a return visit to his doctor, where he was diagnosed with polycystic kidney disease. After that, Jim saw a specialist and had regular meetings with a urologist. When his kidney function deteriorated enough that he had to consider dialysis, doctors sent him to Mayo Clinic's Rochester campus for a consultation. Jim never underwent dialysis but continued to visit Mayo for about a year and a half, until he was eligible for a transplant. Finding a donor might have been the easiest part of the transplant process for Jim. All seven of his brothers and sisters stepped forward to be tested. At the outset, Jim was certain one of his sisters, who is close in age to Jim and has similar physical traits, would be the best match. However, Jim learned those factors are not as meaningful as he thought when it comes to transplant compatibility. "I think she was actually one of the least compatible matches out of the family," Jim says. It turned out Greg was a better fit. Despite their age difference and having only one shared biological parent, a transplant evaluation showed that Greg was the best match for Jim. "That we only have one parent in common and were that compatible is nothing short of a miracle to me," Jim says. The kidney donation and transplant surgeries went smoothly for both Greg and Jim. Afterward, Jim's care team told him he would feel better quickly. But he didn't realize until he had recovered just how much his ailing kidney had been slowing him down. Though he was an active kid growing up, aches and weariness had become part of his routine over the years. He had blamed these symptoms on getting older. "Over the years, my insomnia had become miserable," he says. "I couldn't sleep at all. That was just a daily occurrence and part of my daily life. I didn't know it could be any different for me." Immediately after his transplant, Jim stayed at the Gift of Life Transplant House, a Rochester facility that gives transplant patients and their caregivers an affordable place to live while they undergo treatment. At the house, patients are surrounded by other people going through the same experience. It was a resource Jim truly appreciated. Since his transplant, Jim is a new man. He quickly returned to a level of health he had all but forgotten. He has more energy and feels better. With no noticeable signs or lingering side effects of his kidney disease or the transplant, Jim now stays active by playing basketball and golf. His renewed health and vigor shows in other ways, too. At more than six-foot-four, Jim had never been able to put on weight. On the day of his transplant, he weighed 168 pounds. These days, he hovers around 212 pounds. His face is no longer gaunt, and for the first time in his life, he has been able to gain and maintain a healthy weight. "It's great," he says. "I go back to Worthington and people say, 'You're looking good.' Usually, when people say you look good it's because you've lost weight, but not in my case!" 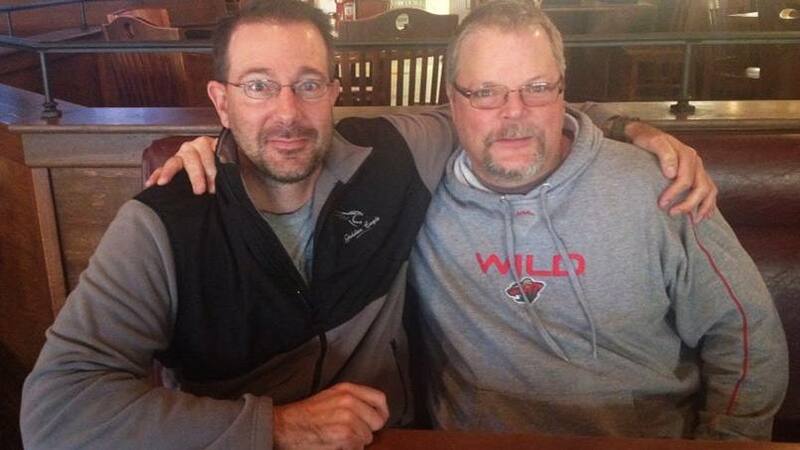 For Greg, there was never any question he would donate his kidney to his brother. He'd have done the same for any of his siblings, he says, and he's confident they would do the same for him. Greg had to take a month off work following the transplant. But he says if he didn't have the scar, he wouldn't know he'd ever had surgery. Jim and Greg are separated by many miles these days. Jim is a bank vice-president in the Brainerd, Minnesota, area, and Greg, a railroad conductor, lives in Omaha, Nebraska. But that hasn't weakened their bond. And while there were jokes before the surgery about what the transplant might mean for the brothers' respective golf games, they always took the transplant itself seriously. "I was hoping he'd take my left slice away from me," Greg says. "He hits it straight, and I still slice it." The brothers are still close and talk regularly. If anything's changed, Jim says, it's that they make more of an effort to tell each other how they feel. "I would say we're both better at saying, 'I love you,' than we were before," he says. "You're just more conscious of it when you go through something like that. It's more of a conscious effort on both parts that you know you need to do it, and that you can't let things go unsaid."